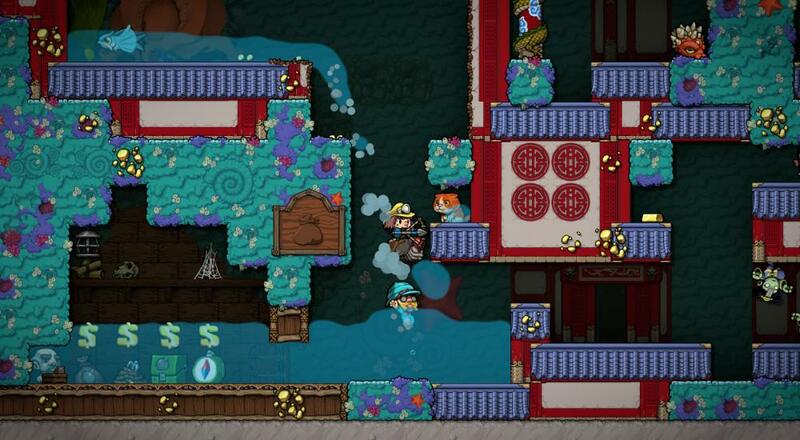 Play as a sloth and fire a gun that shoots kittens? The original Spelunky was a phenomenon that to this day is still one of the most played/talked about rogue-likes in modern gaming history. So, how do you follow that up? By doing more of the same and adding even more layers to it. Spelunky 2 was first announced during last year's PlayStation Expo, but earlier this week, we got our first confirmation of co-op and a preview of some of those new features in action. One of the first new features fans of the first game may notice is the liquid physics that result in a bunch of lava getting dropped on poor Ana's head. Those physics mean that if you cause any kind of liquid to leave its confines, it will follow a path until it finds a new receptacle or reaches the bottom of the level, which could make things even harder for you. The other new feature that we see amidst the reveal of online co-op (!) is the concept of layered levels. Basically, in every level, there will be a door (either hidden or in plain sight) that will take you to a new layer with a different layout than the previous one. In the video (right around the 0:40), this is shown as players first being in a kind of underground looking place, and then in a more jungle environment. I'm sure there are other little things that Spelunky enthusiasts will glom onto in all of this, but I'm just excited to be able to team up with friends online now! There's been no release date announced yet for Spelunky 2, but it will be coming to the PC and PlayStation 4 first (other consoles will likely follow). Four player local co-op and four player online co-op will be supported for every run (no word if combo co-op will be supported). Page created in 1.2369 seconds.